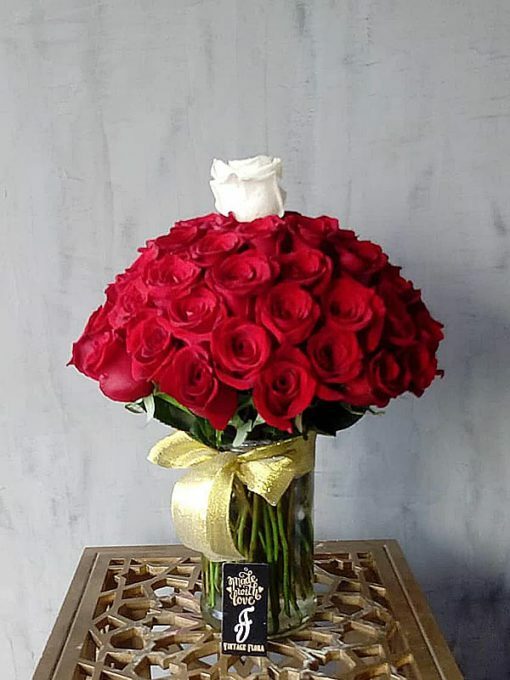 60 of the finest romantic premium red roses are arranged to spherical perfection in a sleek glass cylindrical vase. Nestling in the centre of this large and spectacular romantic gift is a single pristine white rose, offering an irresistible visual contrast. Purchase this product now and earn 57 Vintage Rewards! 60 of the finest romantic premium red roses are arranged to spherical perfection in a sleek glass cylindrical vase. Nestling in the center of this large and spectacular romantic gift is a single pristine white rose, offering an irresistible visual contrast.